The actress also announced that she will be traveling to take a break. Earlier this month, Heart Evangelista-Escudero shared the heartbreaking news that she had suffered a miscarriage. She was on her third month of pregnancy when doctors detected that the child's heart had stopped beating. Since then, Heart has taken a social media break. 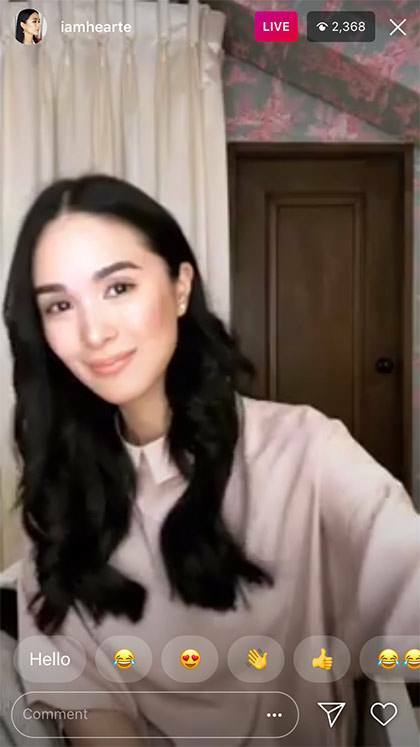 Today, June 22, Heart surprised her followers by doing a short Instagram live session where she opened up about her situation. "Going through this whole storm, [you realize] that too much sunshine will wither you sometimes. And that sometimes, you need to go through the rain, the storm, [and] you witness God's love," she shared. But even with what had happened, the actress remains hopeful: "I'm hopeful. I'm just very positive [even] in my situation, that in His time, it will happen." Heart said that she hasn't left her house much since what had happened, but now, she will be taking a break to help her overcome her situation: "I'm starting to move forward. My husband has decided for me that I should leave the country and take a breather, take a break." She also promised her fans that even though she's on a social media hiatus, she will try to share some moments from her upcoming travel with them. She ended her IG live by thanking her fans (and even those who, she said, "aren't even my fans") for sending her messages of support to help her get through her ordeal. "I'm a better person with everything that I went through, and I'm thankful that I'm gonna be a better mother in the future. I appreciate life even more," she added.